Your branded glass ware, cutlery or china ware that you shopped for Christmas Eve needs to be stored safely. Your kitchen store room should have enough shelves to store edibles, cooking oil, grains and enough space on top to store you precious cook wares. One of the walls can be used to hang ladles and pans. 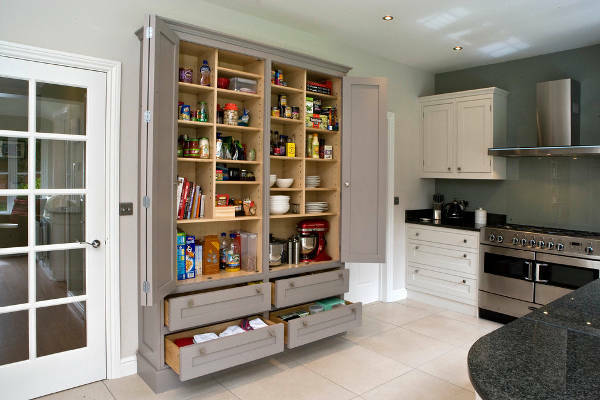 Lower drawers can be used to keep smaller things like cutlery and knives. Dividing sections makes store room look classy, clean and things are more accessible. If you have small storage room utilise every wall to support an open shelf. Use storage boxes of varied sizes to store different things for maximum utilization of space. Label each box to avoid confusion. Make separate shelf to store larger things like suitcases and cartons. Don’t forget to use proper lighting. 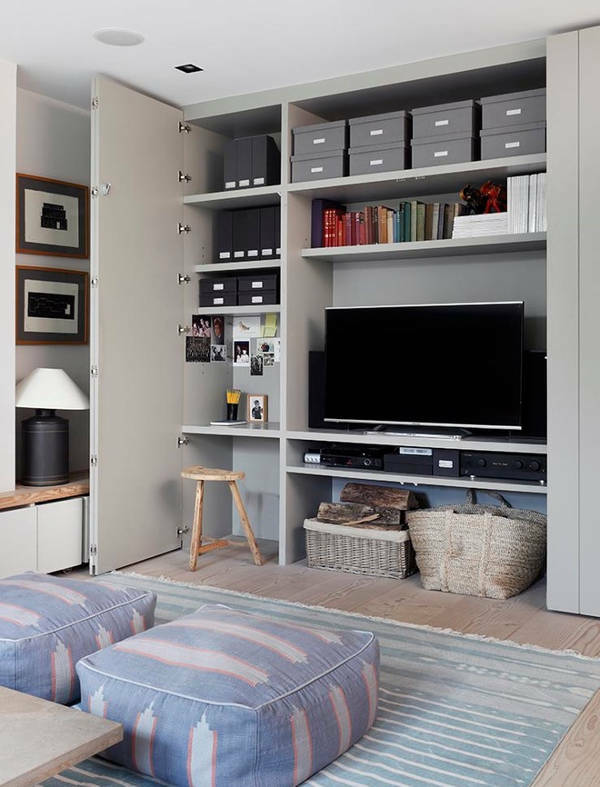 Media wall unit makes for a multipurpose storage for living room. Besides using it to fix your television you can use the shelves to store books, files and table lamp. Use small embellishments to make the setup interesting. Space below can be used to make storage cabinets for CDs and DVDs. You can also use furniture with storage. 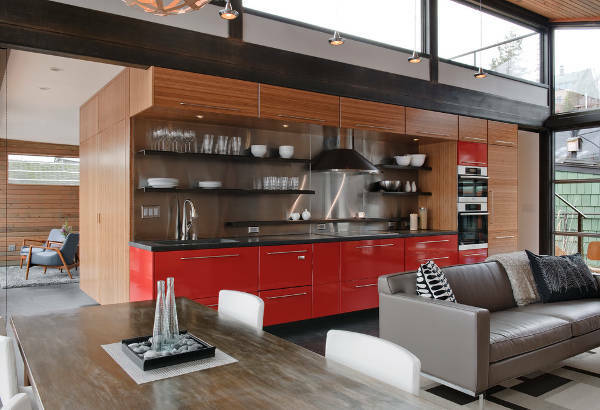 Don’t restrict your dining room to dining table and chairs. Add a side counter to your dining space. You can use this counter to store your expensive crockery. You can also use a high counter with glass doors and showyou’re your rare cut glass pieces. Use the available wall space in your laundry for shelving. 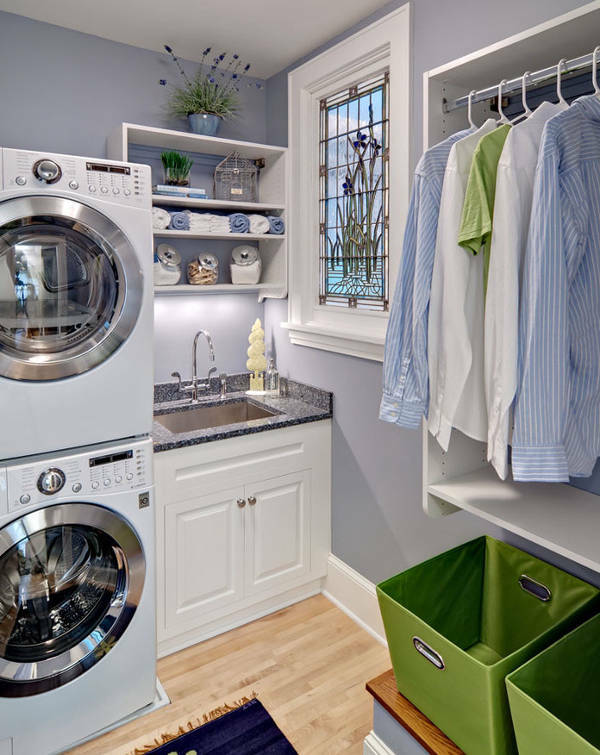 The space above your washer and drier can be used to make a counter where you can keep the basket with dirty laundry. A separate shelf for towel and a hanging place is a must. A separate space to store washing agents and mops make it more organised. Craft paper, glue, card boards, ribbons, colours, threads and the list can go on. Store different craft material in separate boxes and label them. Arrange them neatly on the shelves. You can fix narrow racks on the door to store rolls of ribbons, small bottles for beads and threads. Use hooks to hang cello tapes and scissors. 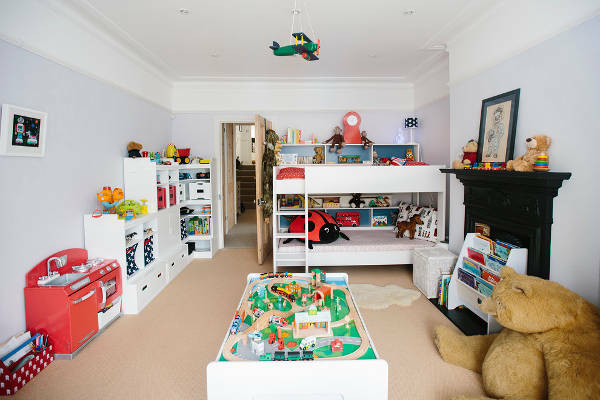 Kids love collecting things and hence they should have a nice place to display their collection. 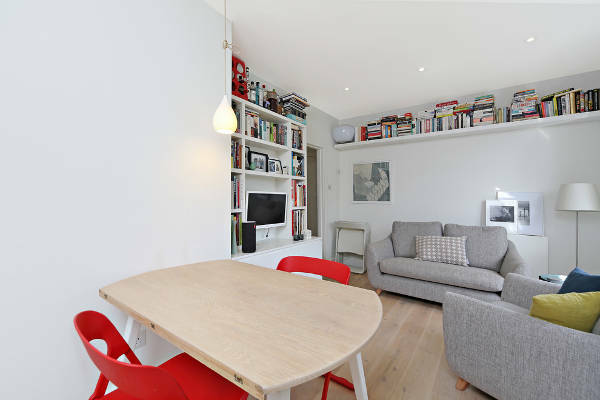 You can think of a sturdy side counter with open shelves to display their favourite toys. Use wooden boxes or vibrant metal tubs to keep toys. 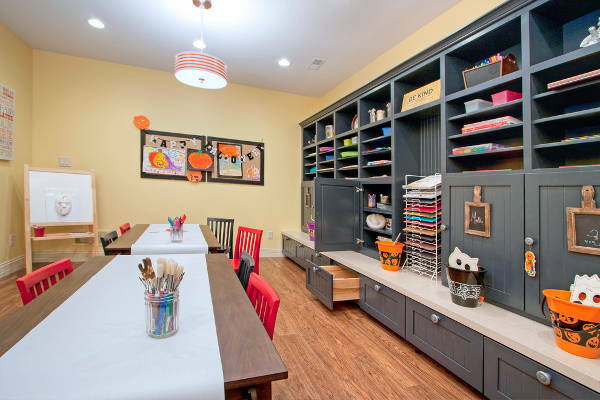 Mostly mudrooms are a narrow walk-through leading you to the living room. If you have enough space you should keep a nice bench in your mudroom to sit and unlace the shoes comfortably. The space below can be used to keep shoes. Instead of hat-stands use hooks on walls to hang coats and hats. 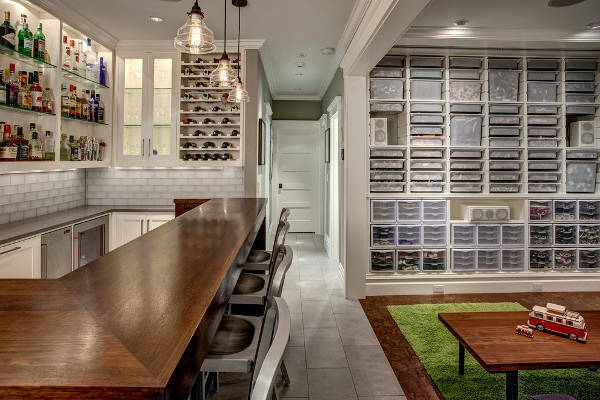 Use sturdy shelving material for storage in your basement to assure longevity. Basements are often dark hence proper lighting is of utmost importance. Use plastic containers to store you valuables to keep them safe from moisture. Your food storage room should have enough shelves to accommodate your food supplies. The height of the shelves should be strategically planned to accommodate bottles of different sizes at the same time without wasting any space. Bottom shelves should be used to store bigger and heavier boxes. 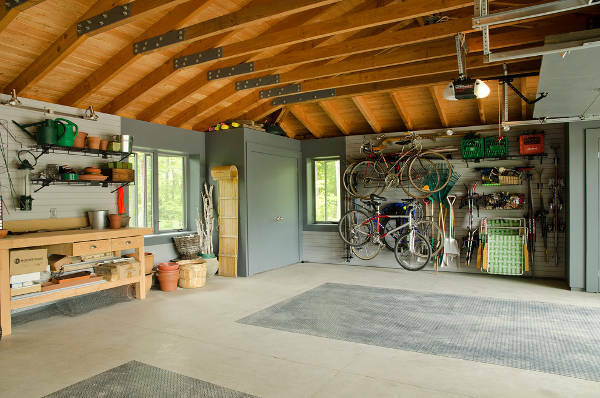 If not organised, your garage can be a mess. Use roll out shelving for maximum utilisation of space. The space above can be used to keep bigger cartons and boxes. You can fix sturdy hooks on wall to hang gardening equipment, your old guitar and even bicycles. 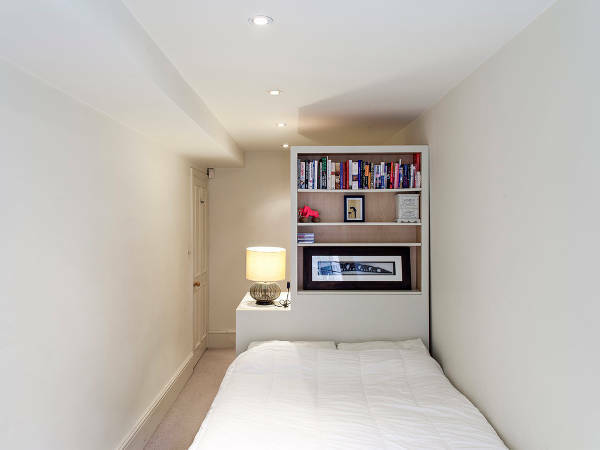 Use the space below your bed to make roll out cabinets where you can store your extra bed linen and pillows. 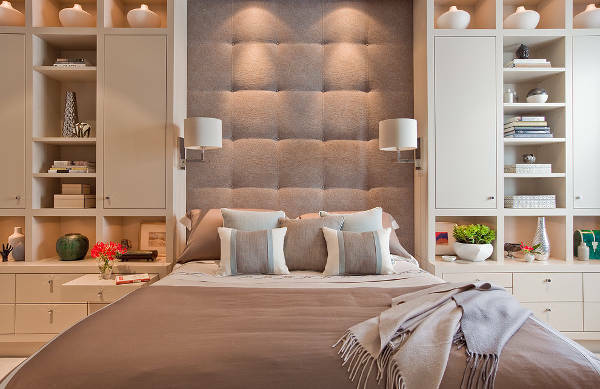 The space around the headboard can be converted into interesting cabinetry to store books, clothes and other valuables. A perfect office storage room is one where you can easily identify what documents can be found where. Office store room should have multiple racks with shelves to store files. Every rack and section should be labelled for identification. There should be a locker to keep confidential documents and also appropriate lighting. Importance of storage room is obvious. It beautifully hides everything that is not in use and keeps your space clutter free. Your storage room need not be boring. You can use small decorative pieces to decorate it. Use interesting pictures on walls. Use indoor plants on counters to make the space livelier. Place flower vase or candle stands to improve its look. Use framed picture on shelves, after all they too need to be stored so why not in style. Material used for shelving especially in basement storage rooms and outdoor storage should be sturdy. Consider water proofing in both these cases as basements and outdoor living spaces are susceptible to moisture and wetness. Make most of these wonderful ideas and remodel your store room into an organised space that breathes.